Unlike my/our previous EBT enhancement project, this one is actually available and usable right now, ie. it forwards all the notes you've entered into EBT and gives you the same confirmation messages as EBT does. This system has been tested and developed using a Nokia 6310i, feedback from other phone owners would be appreciated. WAP wrote: This is a Wireless Application Protocol (WAP) gateway for EuroBillTracker. More information about EuroBillTracker can be found at http://www.eurobilltracker.com" onclick="window.open(this.href);return false;. This gateway was written by avij. to log in to this WAP gateway. The passwords are stored in a secure way on the web server. You will be given your own personal URL (like http://wap.eurobilltracker.eu/cgi-bin/e" onclick="window.open(this.href);return false; ... bfefcdfeae) after you've entered your email+password. It is suggested to place that link to your phone's bookmarks for ease of use. The EBT password is checked only when you're submitting your notes to EBT -- the password is not checked when doing the initial login to this WAP gateway. Please use the usual WWW interface to make sure that your bill gets entered properly to the EBT database. In any case, if you encounter any problems, send me email to eurowap -- miuku -- net or leave me a message on the EBT forums on forum.eurobilltracker.eu. This can be integrated directly into EBT if the webmaster has the time to make the necessary changes (which may be non-trivial depending on the current EBT code), but if he doesn't have the time I'll be happy to keep the WAP page running smoothly at my own website as a service for other EBTers. Last edited by avij on Sun Mar 28, 2004 12:50 pm, edited 1 time in total. If it's PHP it could be added "easily" perhaps ? -- "Excuse me for a moment, I'll just enter the details of this note that the cashier just gave me.. ok, there." -- "Um, what did you just do with that note?" -- "You know, you can see the origin country of the note by looking at the serial number, and you can see where the note is printed by looking at the other number on the other side. 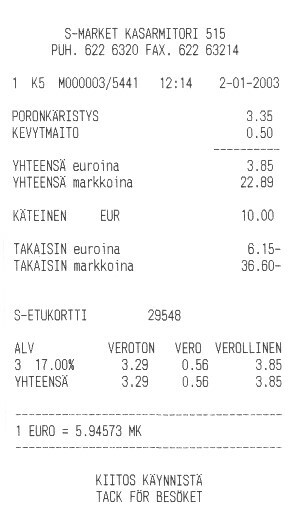 Did you know that some Finnish 50€ notes are printed in UK although UK isn't an euro currency country? Yeah, that's a bit strange. Anyway, when I enter those numbers to my phone, it tells me where it was printed and as an extra, it'll send me email when someone else enters this note somewhere else etc etc (tell more about EBT)"
-- "That's interesting, I didn't know that. What was the web site address again?" As a side note, I have found that it's easier to tell people about EBT by describing it as a service that tells you where your note has been printed, as most regular people don't know how to figure that out by just looking at the note. Once they're familiar with the concept, they may be interested to know that they'll get an email whenever they get a hit. I usually compare note tracking to bird ringing -- you can never be sure when or if you get a message that your note/bird has been seen somewhere, but when you do, it'll make you glad to know that your note/bird is alive and doing well And the notes can "fly" surprisingly far away as well, imagine getting a hit from some distant country. EuroBillTracker wrote: If you've sent me an email about this, I haven't even read them in days because I have lots of pressure at work right now. I will try to figure out what you did by this weekend so I may work on integrating it during the holidays or possibly even giving you some source code...If it's PHP it could be added "easily" perhaps ? It's actually Perl, but the language is mostly irrelevant. If I had written it in PHP you'd have to rewrite most of it anyway as most of the code deals with user preferences and user authentication, which are already handled at EBT. I haven't sent you email about this, but I think I'll send you an email or PM shortly.. I'm quite busy myself too, so I won't have that much time to deal with this in the next few weeks.. It must be very usefull, but since I don't have a WAP phone, I hope someday there will be some programm to input the notess on a Palm and then sent the data once in the dock. Edwin wrote: It must be very usefull, but since I don't have a WAP phone, I hope someday there will be some programm to input the notess on a Palm and then sent the data once in the dock. I do have a Palm m505 myself, but I don't think I have the time to learn how to write programs for it. Are there any freeware/opensource compilers for PalmOS, any experience with those? If it's easy, well, why not..
OK, this is a bit offtopic, but I thought I'd post this thing in the WAP thread anyway. WAP wrote: Submitting note ..
CONGRATULATIONS, THIS NOTE HAS ALREADY BEEN ENTERED -- YOU GOT A HIT! (yeah, the text is slightly more yelling than the one on EBT website). Oh, I think I'll have to breathe again .. huh. Last edited by avij on Fri Jan 03, 2003 12:25 pm, edited 1 time in total. I think I'll have to frame this and put it on my wall or something .. Guess what was one of my motivations for writing this? I'm going to Canary Islands (to some place which I can't remember right now) this spring with some family relatives, and I thought it'd be horrible if I had to write down the serial numbers (shudder). Not entering the notes at all is not an option. Seems like GPRS is available in the Canary Islands, although the price per megabyte is about six times higher than what my GSM operator charges me now (12,81€ vs 2,14€, the Spanish Airtel/Vodafone price includes the 5% billing fee). Well, the data that needs to be transferred is rather small, so I'd have to pay some 5 cents per note when EBTing from Spain. I guess I could live with that cost, at least for short periods of time such as holidays. Too bad that I don't have wap, but fortunatelly in Crete (where I take almost all my holidays) there is an Internet cafe near our usual hotel. Haven't used it though, because in the summer I didn't know nothing about this site. avij, besides the data required to send/receive the note data, you'll also have to account the data needed for the initial GPRS authentication, which is about 15Kb. brunorodrigues wrote: avij, besides the data required to send/receive the note data, you'll also have to account the data needed for the initial GPRS authentication, which is about 15Kb. OK, I'll have to admit that I'm not intimately familiar with GPRS, it wasn't quite ready yet when I was studying data communications. I assume you're talking about the GPRS connection parameters, such as encryption, WAP access point and IP address setup, username+password etc. It may be true that it takes about those 15KB to set up the connection, but those bytes do not seem to be taken into account when the GSM operator bills the GSM user. Looking at my latest GSM bill for December, there have been 58 connections, totalling two seconds short of 4 hours and the data transmitted is 274 KB. When you divide 274 by 58, you'll get about 4,72KB which looks pretty much like the payload data per connection that I'd expect. Also, the sum of total data transmitted matches roughly with the data transfer counters provided by my Nokia phone. YMMV.